This report cover conditions and observations made between Friday, February 6 and Sunday, February 8, 2015. 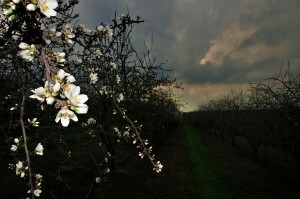 Taken in Stanislaus County, today’s photos for the central region present the first open flowers of the Sonora and the early pink tip stage of the Nonpareil beneath the stormy skies along the eastern foothills east of Hickman and the early green tip stage of the Carmel, near Waterford. Following the driest January on record, rain swept over the northern San Joaquin Valley over the weekend as a series storms passed over the state. While rainfall totals were impressive, most of the storm’s energy was expended over the Sacramento Valley as the flow of moisture turned northward. Nevertheless, observers noted that from 0.6 to 2.0 inches of rain fell between Friday morning and Sunday evening. The most impressive rain fell in the eastern Stanislaus County area on Sunday afternoon when a very heavy downpour flooded many of that area’s orchards with as much as an inch of rain in just one hour. Unfortunately, the warm nature of the storm failed to produce significant snow accumulations in the Sierra Nevada watershed. Daily temperatures over the weekend reflected the storm’s tropical origins with morning lows reported in the low to mid 50’s, while afternoon highs rose to as high as 70 degrees. Blustery winds accompanied the weekend storms with strongest gusts reported in excess of 30 mph. While the bees did venture from their hives during the calmer hours of the period, the wet, windy conditions kept them sequestered in their hives for all but a few hours of the weekend. 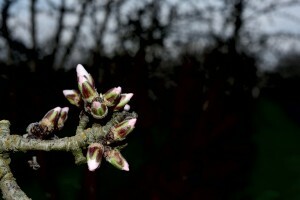 Observers are reporting that the mild temperatures are supporting steady bud development across the region. 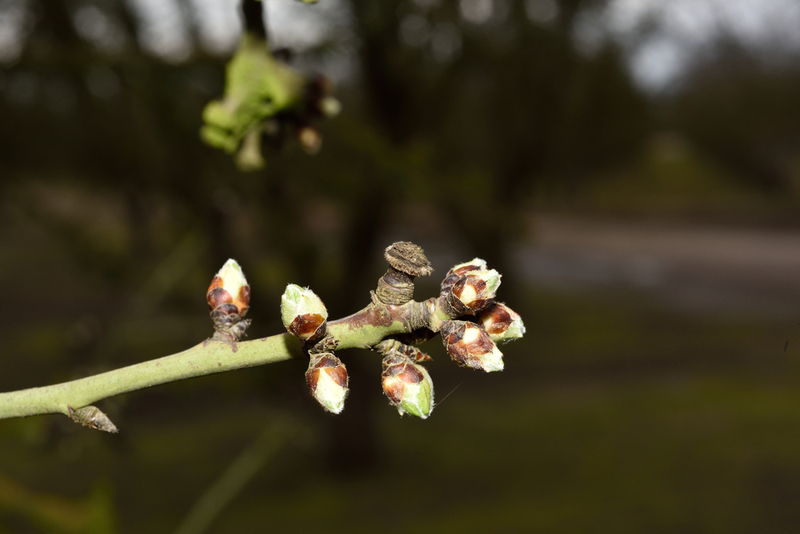 As is normally the case, the early blooming Sonora variety is running well ahead of its associated Nonpareil, with Sonora plantings along the west side of the region running slightly ahead of those along the Highway 99 corridor and the eastern foothills. Within the Sonora, isolated, advanced examples are presenting as much as 30% of their flowers for pollination, while many younger, more vigorous plantings have just a scattering of open flowers. Observers are also reporting that many California type plantings, including the Aldrich, Price and Fritz are running ahead of the Nonpareil, with the first open flowers particularly advanced plantings just beginning to make their presence known. Meanwhile, Carmel plantings are generally lagging behind the Nonpareil, with buds of this important pollenizer now moving into the green tip stage. We anticipate presenting values for each stage of development beginning with the next report. Bees in plantings that have received their hives were aggressively working the fields during the calmest hours of the weekend searching for flowers to forage upon. 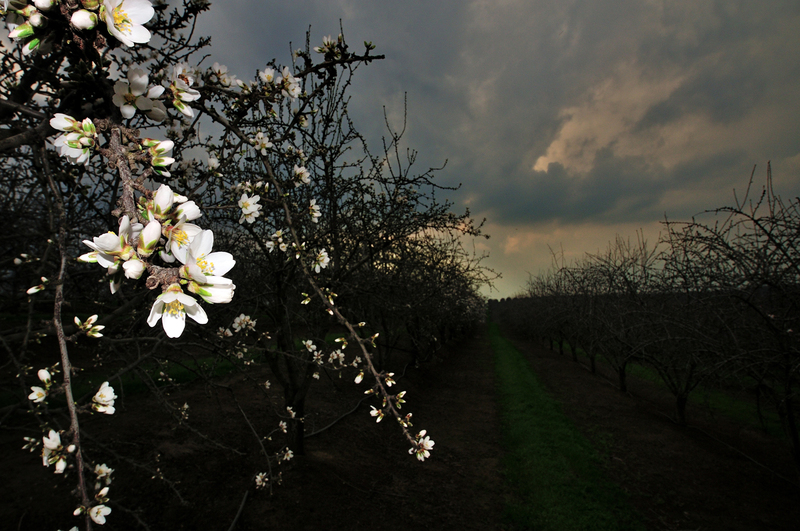 Given the lack of flowers in nearly all plantings, their efforts were focused on the flowering weeds in and around the region’s orchards. Hive deliveries will continue over the coming week as beekeepers bring hives from storage yards and out of state locations.